As a children's librarian and pet rat lover, I can't say enough good things about this book. 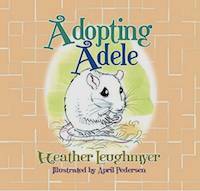 Children will love the rhyming verse and sympathize with Adele's plight. The story accurately describes these incredible, misunderstood creatures. It is a perfect read-aloud for kids from 3 and up. I will be using it in my preschool and elementary storytimes. A big thank you goes out to Ms. Leughmyer for a truly wonderful book.